Restore the Delta (RTD), opponents of the Bay Delta Conservation Plan (BDCP) to build the peripheral tunnels, today blasted Governor Jerry Brown for urging President Obama to pressure federal scientists to suspend their expert judgment and approve his tunnels. In a short clip from Sacto TV KCRA Channel 3 on January 30, Jerry Brown described his conversation with Obama talking about the "Delta project" and says (starting at about 18 seconds) "lower level [Federal] officials aren't being helpful …. in fact quite the opposite." Barrigan-Parrilla said that instead of operating in a manner that plans for regular droughts, the State Water Project depletes storage under the theory that they should 'take it while it's there,' and they thereby make the dry year shortages even worse. “This past year the State pumped over 800 thousand acre-feet (TAF) more than it had promised, making the water shortage worse, and compliance with water quality and fishery standards impossible,” she explained. Restore the Delta issued the statement on the same day that the Department of Water Resources (DWR) said State Water Project customers would get zero water deliveries this year if the drought conditions continue. "Except for a small amount of carryover water from 2013, customers of the State Water Project (SWP) will get no deliveries in 2014 if current dry conditions persist and deliveries to agricultural districts with long-standing water rights in the Sacramento Valley may be cut 50 percent – the maximum permitted by contract – depending upon future snow survey results," according to DWR. "It is important to note that almost all areas served by the SWP have other sources of water, such as groundwater, local reservoirs, and other supplies." Barrigan-Parrilla urged the state and water agencies to invest in projects that yield new water and jobs, rather than spending billions on the fish-killing twin tunnels. “We have had three dry years in a row and the governor admits the tunnels won’t add one drop of water to our drought-plagued state," she stated. "We need solutions more appropriate to our future water challenges, not this $60 billion mega-project that would misspend the billions needed for sustainable water solutions." “The better approach would be to invest wisely in projects that actually produce new water and local jobs. California needs more water recycling projects, such as Orange County's that is producing enough water for 600,000 residents each year. By cleaning up groundwater, we will create another new supply and room to store water when it is truly available," concluded Barrigan-Parrilla. Great article, thank you. Sounds very similar to the Keystone Pipeline project, where they whitewashed the environmental study and the money grabbers are all in line telling Obama he needs to approve it for jobs and economic development. 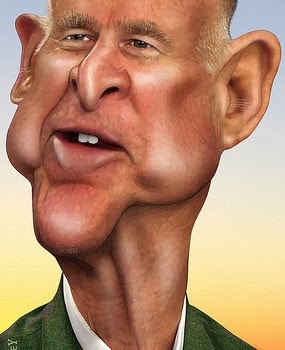 Maybe Brown can carry his water on the high speed rail!